On the right panel of our Figure 1, we see where the NYT writers got their statistic. The far right bar shows that the midpoint of the gray “uncertainty range” is above a 10-percent level of damage to the U.S. economy. However, how likely is this outcome? As the NCA chart itself shows, this enormous damage estimate is an outlier. In particular it is colored red, which the legend in the top left of the diagram shows is an “RCP8.5” scenario. 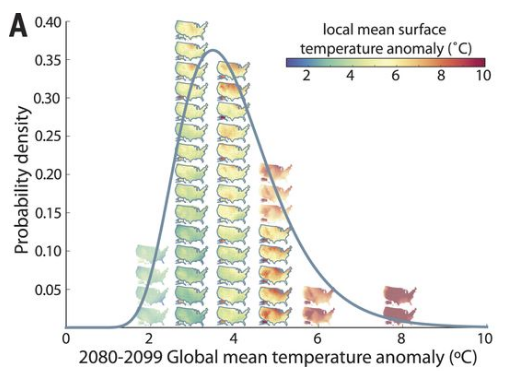 The other RCP scenarios (blue and green bars) are nowhere near this level of warming or damage. Furthermore, notice that all of the other red bars indicate much smaller temperature increases, and hence damage. Although the RCP8.5 could be classified as “business-as-usual” because it assumes no government policies to mitigate emissions, it nonetheless involves more emissions than most “business-as-usual” scenarios in the literature. In other words, it is a relatively pessimistic scenario to adopt, even if we assume no major government action. And so we see that in order to focus attention on the RCP8.5 scenario, we are already building in pessimism, above and beyond the “governments do nothing” assumption. Furthermore, if writers at the NYT and elsewhere want to use the NCA’s worst-case projections as motivation for climate change, then they can’t also tout the continuing progress in “clean energy”—because the RCP8.5 scenario assumes a sudden stall in the historical progress on lowering emissions per unit of economic output. But wait, it gets worse. Even though we’ve seen how dubious the RCP8.5 scenario is, let’s stipulate for the sake of argument that we’ll be in it through the year 2100. Still, how likely is the extreme warming that the NCA report says could cause a 10-percent hit to the U.S. economy? For that, we need to follow the citations. The chart in Figure 1 above ultimately comes from a 2017 Science article by Hsiang et al. In the Science version, the temperatures are expressed in Celsius, but otherwise it is clearly the same material. SOURCE: Hsiang et al. 2017, Figure 1. In order to get to the particular simulation involving a 10-percent hit to GDP, the Hsiang et al. study needs more than 7 degrees Celsius of warming. Yet as Figure 2 above shows—all assuming RCP8.5—that only happens on the far right-hand tail of the probability distribution. The overwhelming bulk of the area under the curve is well to the left of that much warming. If this were a standard statistical test, we could safely “reject” the hypothesis of warming in the range necessary to generate the extreme damage projections. Fortunately here at IER I have already explored the cost estimates in the Clarke et al. 2014 references, which are to the previous UN IPCC Fifth Assessment Report (AR5). For a full recounting of my analysis, here is my post. For our purposes, the most important takeaway is this: According to the very literature that the NCA refers us to, the cost of limiting warming to 2 degrees Celsius by the year 2100 could be anywhere from 2.9 to 11.4 percent of consumption, with a best-guess of 4.8 percent. Go look again at Figure 1 above, taken from the NCA report. Most of the projected outcomes involve less than 4.8 percent damage to the U.S. economy! Furthermore, the tradeoff is even worse than you might initially think. For even if we limited warming to two degrees Celsius (and incurred 4.8 percent damage to U.S. consumption), there would still be climate change damage, according to the official models—that’s why the UN recently urged an even lower target of 1.5 degrees. This is why the most recent UN report, as well as the new NCA, refrain from engaging in a cost/benefit analysis altogether. If they did explicitly compare the costs of mitigation policies to the estimated economic impacts of climate change, then it wouldn’t even be close. To be sure, advocates of extreme intervention can point to unlikely but catastrophic scenarios, and/or they can say the models leave out important things, but it would be more difficult to then claim the mantle of “scientific consensus” when they are ignoring the Obama Administration’s own “social cost of carbon” estimates. The recent NCA misleads the public, and the media should do a better job digging into the assumptions underlying its pronouncements. In particular, the alarming projections of economic damage rely on the RCP8.5 scenario, which is very pessimistic and in any event rules out the innovations in solar and wind that advocates assure us are just around the corner. Furthermore, even within the RCP8.5 scenario, it is unlikely that the U.S. will suffer extreme damage. The NCA itself doesn’t discuss the cost of mitigation policies, but the previous UN IPCC report did. Looking at the NCA’s own numbers, it’s not at all clear that pursuing aggressive government action to mitigate climate change would produce benefits in excess of costs.